This chapter sets out to illustrate potential errors made in the imaging of a child with a malignancy. Pitfalls range from selecting an incorrect modality or using suboptimal protocols to incorrect interpretation of abnormalities. A common mistake with children’s tumours is performing a non-contrast CT as a preliminary evaluation. Due to a paucity of mediastinal and retroperitoneal fat in young patients, non-contrast CT of the chest and abdomen is seldom if ever useful and should be avoided in the setting of a potential new tumour. If CT, rather than MRI, is the optimal test, then only post-intravenous contrast-enhanced CT images should be performed. Multiphase scanning is not necessary bearing in mind that all superficial, accessible or abdominal mass lesions should be evaluated with ultrasound initially, including a Doppler vascular assessment. Most paediatric tumours are large at presentation and easy to identify—the correct differential diagnosis is entirely dependent on the age of the child. 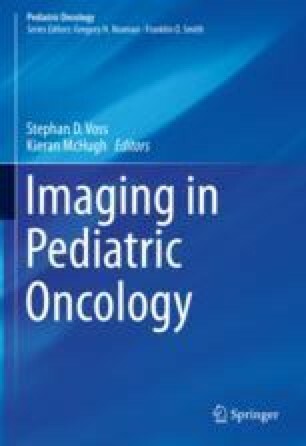 http://www.eurosafeimaging.org/wp/wp-content/uploads/2014/02/European-Guidelines-on-DRLs-for-Paediatric-Imaging_Revised_18-July-2016_clean.pdf. Accessed 26 Mar 2017.